Herpes Zoster also known as Shingles is an acute viral infection of the sensory nerve caused by a variety of chickenpox virus. It is an inflammatory skin condition in which the varicella zoster virus produces a painful vesicular eruption along the nerve tracks leading from one or more dorsal root ganglia. After a primary chickenpox infection, the virus persists in a dormant state in the dorsal ganglia. The virus may then become active again in later years, either spontaneously or in association with immunosuppression, to cause the eruptions. 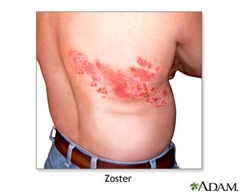 Herpes zoster may progress too chronic pain syndrome (postherpetic neuralgia), characterized by constant aching and burning pain or intermittent lancinating pain or hyperesthesia of affected skin after healing. Herpes zoster is communicable a day before the appearance of the first rash until five to six days after the last crust. Eruption may be accompanied or preceded by fever, malaise, headache, and pain. Pain may be burning, lancilating, stabbing or aching. Inflammation usually unilateral, involving the cranial, cervical, thoracic, lumbar, or sacral nerves in a bandlike configuration. After 3 to 4 days, patches of grouped vesicles appear on erythematous, edematous skin. Early vesicles contain serum, these later rupture and form crusts. Scarring usually does not occur unless the vesicles are deep and involve in the dermis. Patient may have a painful eye if ophthalmic branch of the facial nerve is involved. Lesions usually resolve in 2 to 3 weeks. Culture of varicella zoster virus from lesions or detection by fluorescent antibody techniques, including monoclonal antibodies. Antivirals, such as acyclovir or valacyclovir, interfere with viral replication; may be used orally in all cases but especially for the treatment of immunosuppressed or debilitated patients (I.V route). Antivirals are most effective if started within 48 hours of onset of symptoms. Corticosteroids early in illness for severe herpes zoster if symptoms measures fail; given for anti-inflammatory effect and relief of pain. Aspirin, acetaminophen, nonsteroidal anti-inflammatory drugs, or opiiods to manage pain during the acute stage; good pain control may reduce the incidence of postherpetic neuralgia. Asses the patient’s level of discomfort and medicate as prescribed. Teach the patient to apply wet dressings and calamine lotion for soothing and cooling effect on inflamed tissue. Teach relaxation techniques, such as deep breathing, progressive muscle relaxation, and imagery, to help control pain. Apply anti-bacterial ointments (after acute stages) as prescribed to soften and separate adherent crusts and prevent secondary infection. Teach the patient to use proper hand-washing techniques to avoid spreading herpes zoster virus. Advise the patient not to open the blister to avoid a secondary infection and scarring. Reassure the patient that shingles is a viral infection of the nerves.